BACKGROUND: Excessive perioperative fluid administration likely increases postoperative cardiovascular, infectious, and GI complications. Early administration of diuretics after elective surgery facilitates rapid mobilization of excess fluid, potentially leading to decreased bowel edema, more rapid return of bowel function, and reduced length of hospital stay. OBJECTIVE: This study aimed to evaluate the benefit of early diuresis after elective colon and rectal surgery in the setting of an enhanced recovery after surgery practice. DESIGN: This was a prospective study. SETTINGS: The study was conducted at a quaternary referral center. PATIENTS: A randomized, open-label, parallel-group trial was conducted in patients undergoing elective colon and rectal surgery at a single quaternary referral center. INTERVENTION: The primary intervention was administration of intravenous furosemide plus enhanced recovery after surgery on postoperative day 1 and 2 versus enhanced recovery after surgery alone. MAIN OUTCOME MEASURES: The primary outcome was length of hospital stay. Secondary outcomes included 30-day readmission rate, time to stool output during hospitalization after surgery, and incidence of various complications within the first 48 hours of hospital stay. RESULTS: In total, 123 patients were randomly assigned to receive either furosemide plus enhanced recovery after surgery (n = 62) or enhanced recovery after surgery alone (n = 61). Groups were evenly matched at baseline. At interim analysis, length of hospital stay was not superior in the intervention group (80.6 vs 99.6 hours, p = 0.564). No significant difference was identified in the rates of nasogastric tube replacement (1.6% vs 9.7%, p = 0.125). Time to return of bowel function was significantly longer in the intervention group (45.4 vs 48.8 hours, p = 0.048). The decision was made to end the study early because the conditional power of the study favored futility. LIMITATIONS: This was a single-center study. 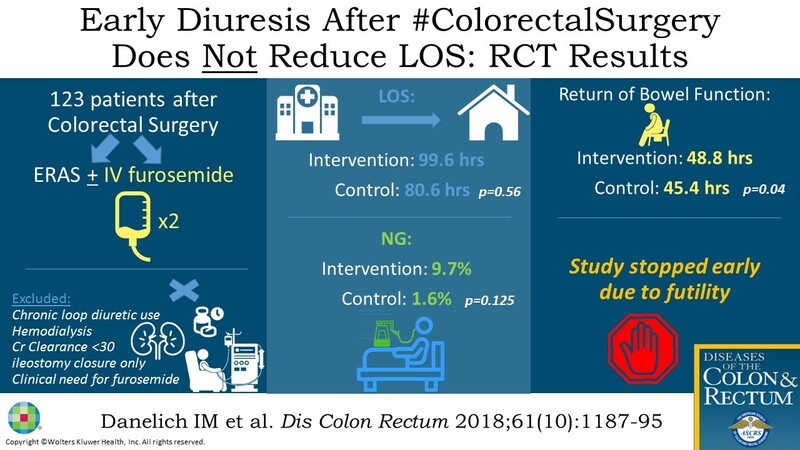 CONCLUSIONS: Early administration of furosemide does not significantly reduce the length of hospital stay after elective colon and rectal surgery in the setting of enhanced recovery after surgery practice. See Video Abstract at http://links.lww.com/DCR/A714. Support/Funding: This study was funded by a research grant from Mayo Clinic Pharmacy Services Discretionary Fund. Dr Bergquist receives salary support from the Mayo Clinic Clinician Investigator Training program. The Mayo Clinic Robert D. and Patricia E. Kern Center for the Science of Health Care Delivery provides in kind support for Dr Bergquist. The Center for Clinical and Translational Science (UL1 TR000135) provided support for data acquisition and randomization (REDCap). Diseases of the Colon & Rectum61(10):1187-1195, October 2018. Articles in PubMed by Ilya M. Danelich, Pharm.D., B.C.P.S. Articles in Google Scholar by Ilya M. Danelich, Pharm.D., B.C.P.S. Other articles in this journal by Ilya M. Danelich, Pharm.D., B.C.P.S.